Hand needle point in colors of browns, mustard yellow and greens, hand brimmed edge and finished back in green satin. 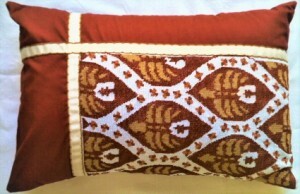 31"x14.5"
Greek pattern cross stitched in red, orange and black colors table runner. 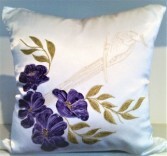 Finished back with beige satin. 35.5"x15"
Hand painted purple flowers with bird stamp on white satin fabric. 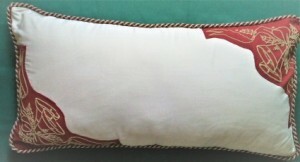 Finish back white satin and zipper one end. Brown (cinnamon)cotton fabric with hand needle point pattern pillow with matching colors brim. Three buttons on back. 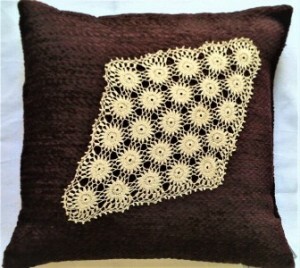 10"x16"
Burgundy color chenille jacquard willow with hand crochet beige color lace stitched on. 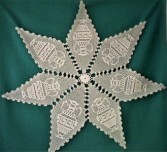 16"x16"
Christmas bells design knots stitched on red cotton fabric. 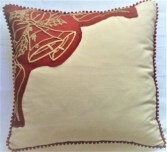 Pale yellow cotton base front and back with red brim finish with three buttons in back. 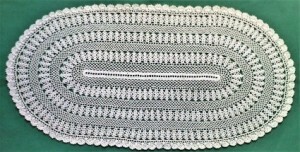 14"x14"
Hand crochet oval table runner, white 22.5"x12"
Seven diamond shape hand crochet, attached together, traditional Greek pottery pattern, beige color, over all 28" in diameter. Hand needle point wall deco in wooden frame, padded, in ruby, burgundy and green floral pattern, green felt finish back, 15"x6.5"
Want to send house warming gift to a friend? 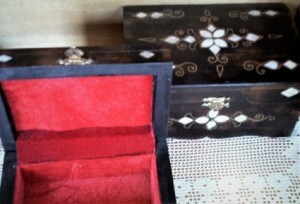 Let us design a basket/container with different gift items we carry in our shop. 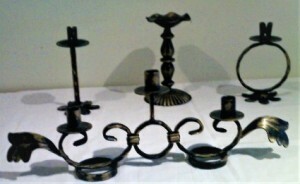 Metal candle holder, black with bronze, each is different. Christmas bells design knots stitched on red cotton fabric on Pale yellow cotton base front and back with red/gold brim finish and zipper one end. 33"x17"
Traditional Cypress from Lefkera region lace, perfect for counter or table top in beige color. 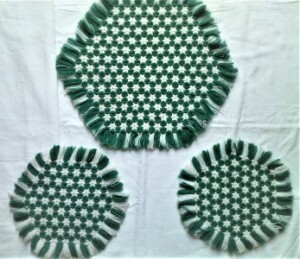 33"x14"
Hexagon shape 3 pieces hand work wool in green and white. 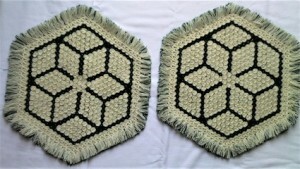 two small ones 12"x11", one big one 17.5"x16"
Hexagon shape two pieces made of wool table top in pale yellow and green. 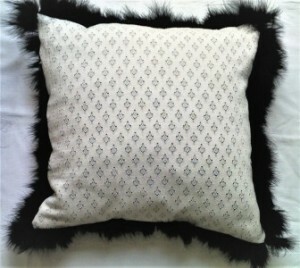 15"x17"
Off white fabric front and back with black feather brim with zipper in back. 19.5"x19.5"
Flowers convey a message that cannot be put into words. WATER LILY FLOWERS AND GIFTS of Wiscasset, ME provides a variety of fresh, fashionable floral designs to ensure that your gift is one of elegance and beauty. 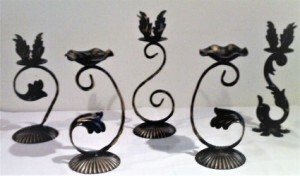 When you're looking for a unique hostess gift, token of appreciation or just a surprise to brighten someone's day, let WATER LILY FLOWERS AND GIFTS customize and deliver one of our many fun, decorative & luxury gifts! We create dazzling presentations that are sure to please for any gift-giving occasion. 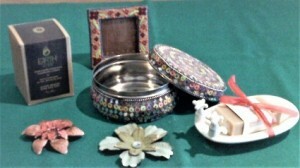 To get your custom gift items, come by and see WATER LILY FLOWERS AND GIFTS - your local Wiscasset, ME florist.